New Rep’s production of Man of La Mancha is excellent. Get your tickets right now. 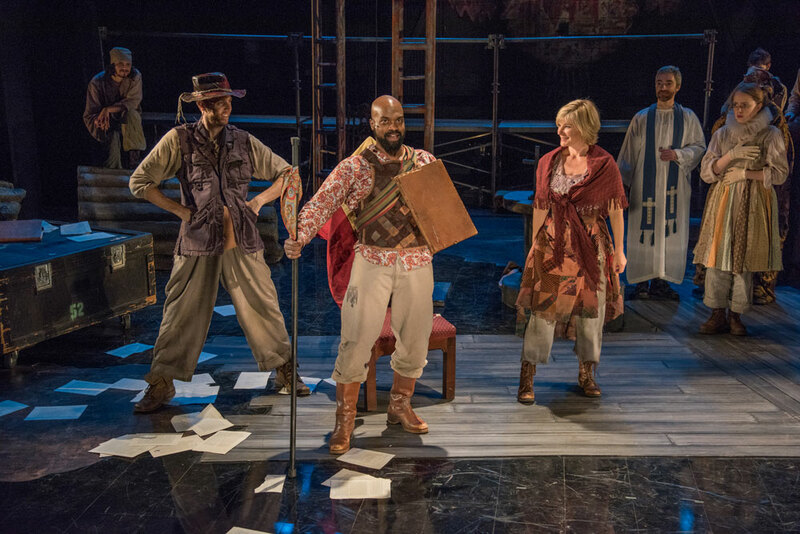 The musical incorporates the novel Don Quixote into a fictionalized account of author Cervantes’ stint in jail. In it, the actor and playwright Cervantes (Maurice Emmanuel Parent) reenacts his play for the other prisoners about a neurodivergent poet with a hero’s heart. The hidalgo Alonso Quixano (Parent) becomes mad in his retirement and takes to adventuring across the land with his loyal life coach Sancho Panza (Michael Levesque). His mission becomes the objectification of an misused tavern wench named Aldonza (Ute Gfrerer). Cervantes convinces the prisoners of his artistry only to be ushered away to convince the Inquisition of his innocence. The tickets selling point for many will likely be the promised outstanding performances by Parent, Levesque and Gfrerer. As it should be; the three perform admirably and deserve the accolades. Still recognition must be given to the larger ensemble. The cast creates together an stage environment that lifts up all individual performances. Without such stability provided through trust and camaraderie, the leads would have been good but not nearly so effective. Be it the interpersonal relationships, the direction by Ocampo-Guzman and Reiffel, or the magic of theatre that caused it, the ensemble work is most definitely worthy of praise. Freedom fighters rejoice, this is a production ripe with topical symbolism. For example, Eric Levenson designed the set to look like the Francoist flag. His use of pillars connotes a land divided, not unified. The plastering of the coat of arms on the back wall conveys the hopelessness of those suffering in jail. The lighting design by Jeff Adelberg casts factual shadows on our villains. If Spanish politics is mocked, it is in recognition of the fascist state’s hypocrisy. Any parallels to the current US political climate are surely intended. Good art uses the counterfeit to reveal humanity’s truths. Man of La Mancha is the fictional telling of a madman’s ravings. It’s also a beautiful tale about a man brave enough to not only dream but to pursue his dreams despite great opposition from his conservative, risk averse family of brown nosers. The world needs more adventuring dreamers fighting monsters for the greater good. This entry was posted in Musicals and Opera and tagged Don Quixote, Kitty Drexel, MA, Man of La Mancha, Maurice Emmanuel Parent, Michael Levesque, Miguel de Cervantes Saavedra, Mosesian Center for the Arts, New Rep Theatre, Ute Grferer, Watertown by Kitty Drexel. Bookmark the permalink.